Is there a work more familiar, more beloved, and more abused in the whole choral repertoire than Handel's Messiah? Dragged out annually for Christmas -- AKA the silly season, the big buying binge -- it now, shopworn, a bit musty, and sometimes still surprising, it receives all manner of performances. Originally sung by male soloists and an all-male chorus of no more than a few dozen voices, in modern performance traditions the chorus has swelled to 100, 150, even 200. Sopranos and mezzos long ago replaced men's voices. A full symphony orchestra of Toscanini-like proportions delivers the delicately scored, subtly coloured music. Stir vigorously and serve, if you can, piping hot. Thanks to Bruce Pullan's effective and stylish direction, this was a savoury, relatively piping hot offering of the season. The size of the orchestra was restrained and appropriate (about thirty), and even the vast choir in the vast space of the barn that is The Orpheum just about right. Pullan's tempi were at points driving and quick, but the Vancouver Bach Choir was disciplined throughout, its entrances spot on, and its care of dynamics exemplary. At moments the sound was vibrant and warm, and the Choir certainly rose to the mighty challenges of its "big" moments -- the three choruses of Part II and "Hallelujah" -- but there was a lack of bite in others, the delicate balancing act of commitment and excitement holding some perils. The soloists and the Vancouver Symphony Orchestra were the evening's high-scorers.The orchestra's brass section, in particular (and once again), played exquisitely. If last trump there is, the trumpeter of the evening should be called on to deliver it. His breath control over the cascading sounds was spellbinding. The violins were bright, even luminous. The three male soloists made an impressive contribution, their large voices calculated for full emotional impact, and their surprisingly clear enunciation obviating the need for the text, not supplied in the somewhat skimpy programme, whose space for the "Programme Note" was so curtailed as to allow Maestro Pullan to say little of interest about the work itself. Aaron St Clair Nicholson gave trumpet and full orchestra a run for its money in his magisterial "The trumpet shall sound," while the several recitatives and arias taken by David D. Q. Lee were a ravishing of the ear, his male soprano effortlessly negotiating the trills and high notes. And, oh, the high notes: simply thrilling in "But who may abide the day of his coming." He had them, he knew it, and he sang with compelling authority. His delivery of the texts, marvelously incisive, was also dramatically appropriate. The other male voice, that of tenor Roger Honeywell, was large and powerful (a real tenore con testosterone this, with hints of Peter Pears blended with sprinklings of the Jon Vickers sound). Mr Honeywell's angry "Thou shalt break them" was impassioned, and he sung with conviction and intelligence throughout. The contribution by soprano Rhoslyn Jones was not on the same level as the gentleman. In Part I, she had not quite warmed up, and doubts linger doubts about the maturity of the voice. Technique was in place, but the sound at times not fully controlled at its edges. There was also some over-characterization, the music delivered as if she were on the opera stage. An oratorio specialist she's not -- at least at this early point in her career. All in all, this was a pleasant evening with particular moments to be treasured and pondered. It showed off the Vancouver Bach Choir on its mettle. Especially fine was the impressive work of David D. Q. Lee and Roger Honeywell. 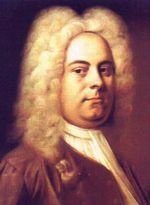 And, it convinced yet again that Handel is one of those composers brushed all o'er with genius. Pity we don't hear more of the vast canon he left behind, but that is for the more adventuruous players on the music scene where at least Semele and some of the other oratorios -- Saul, Samson -- get fairly regular outings. As to their absence outside the major centres, "Behold, I tell you a mystery."